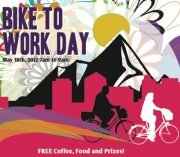 Bike to work day is May 18th! Posted by Lisa Malde on May 3, 2012 on the Salida Citizen. May is National Bike Month and we are celebrating with cycles on May 18th with Bike to Work Day, with coffee food and fun prizes from 7am to 9am! Bike-to-Work Day is a yearly international event that originated in Europe advocating the importance of bicycling as a means of transportation. The central aim of the Bike-to-Work Day is to give Chaffee County citizens the opportunity to help the environment and exercise in a fun and social way – all before work! Bicycle commuting is a healthy and safe alternative to driving, especially on May 18th when our local Bike-to-Work Day sponsors organize bicycle-related events and pit stops with snacks and prizes. We are so pleased to have educated, concerned and supportive sponsors like these to help you safely and comfortably ride your bike to work! Remember to follow the rules of the road; for a refresher, visit The League of American Bicyclists Rules of the Road page.